This is the Manhattan arm of the Triborough Bridge. Robert Moses wanted it to cross the Harlem River at 103rd Street (a straight shot across Ward's Island into Queens) but a variety of pressures resulted in it being constructed at 125th Street instead. It was built to resemble the George Washington Suspension Bridge across the Hudson River (on the other side of Manhattan) with its tall, steel-laced towers. Its a three-span bridge with a 310 ft lift span supported on 210 ft high towers and a 770 ft total length. In the closed position the deck has a 55 ft vertical clearance over the Harlem River and in the open position it is 135 ft above the river. The bridge carries six lanes of traffic and two sidewalks. It was originally going to be the world's heaviest lift bridge, but the designer, Othmar Ammann was able to reduce its weight by such means as replacing the concrete deck with asphalt on a steel deck. The Triborough Bridges were opened to traffic in 1936. 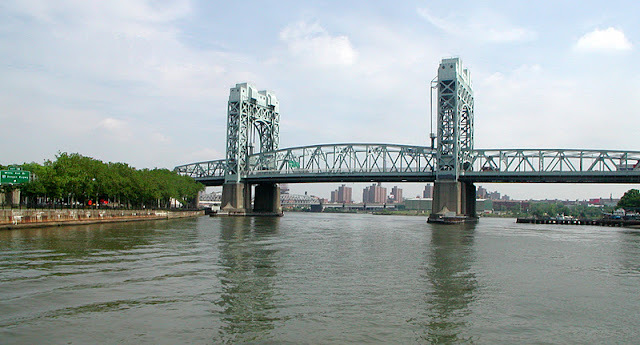 New York City's Bridges: Triborough Lift Bridge by Mark Yashinsky is licensed under a Creative Commons Attribution 3.0 United States License.